I remember my first encounter with RSV (respiratory syncytial virus).... I also remember how terrible it was. We had two children then, one was 18 months old, the other was 3 months old. They had terrible coughs and wheezing. I took them to the doctor, and we were told they had RSV. We then had to give them nebulizer treatments every four hours around the clock... and pray that everything wouldn't worsen. Overall, we were lucky. Both of the children were born at full term (which greatly reduces risks), and the illness didn't turn into pneumonia or make them be hospitalized. Not all children are that lucky. 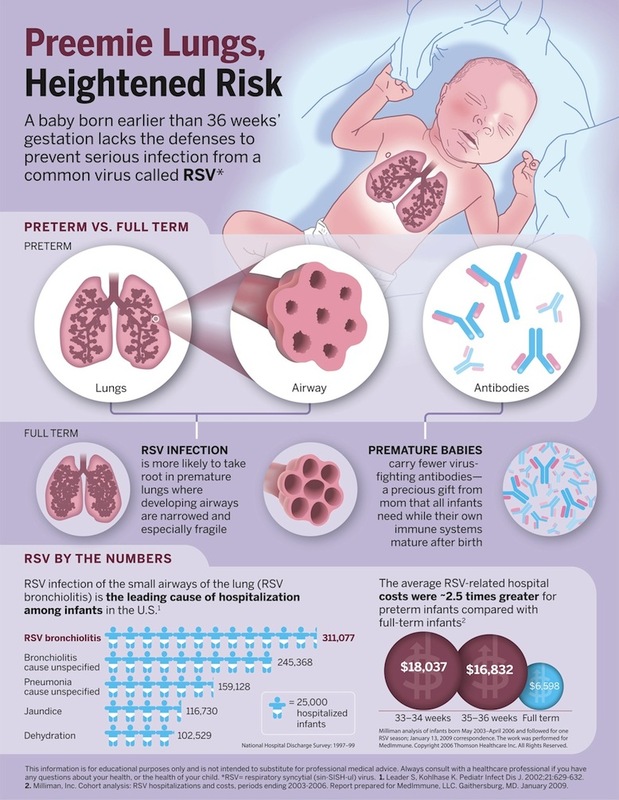 RSV is common. Most children get it at least once before the age of two. RSV is spread like the common cold. You can do a few things to help prevent your baby from getting RSV. RSV can live on surfaces for about 7 hours. Washing your hands frequently, and before touching your baby, washing bedding often, keeping the baby away from smoke (including not letting anyone smoke in your home) and keeping your baby away from crowds and other sick children will all help reduce the chance of your child getting RSV. · Call before you visit. New parents need time to set up a routine and bond. By giving them time to do so before you visit, you are respecting the new family. · Postpone a visit if you feel that you may be getting sick, have recently been ill or exposed to illness. · Remember that parents know best. If you feel they are being overprotective or overly cautious, just consider that only they know what’s best for the health of their new son or daughter. · Offer to do something to ease their responsibilities as they spend time as a family, such as laundry, cooking or dishes. Sleep-deprived moms and dads will appreciate your help! · Wash your hands frequently—upon entering the home and especially prior to holding the baby. Parents, and the new baby, will appreciate it. · Leave toddlers at home, especially during the winter months. Young children, especially if they attend day care or preschool, often carry germs and viruses, like RSV, that are easily spread. · Almost every baby will contract RSV by age 2, but only 1/3 of moms say they’ve heard of the virus. · Serious RSV infection is the leading cause of infant hospitalization, responsible for more than 125,000 hospitalizations and up to 500 infant deaths each year. · There is no treatment for RSV, so it’s important for parents to take preventive steps to help protect their child (e.g., wash hands, toys, bedding frequently; avoid crowds and cigarette smoke). · Certain babies are at an increased risk of developing serious RSV infection, so it’s important to speak with a pediatrician to determine if a baby may be at high risk for RSV, and discuss preventive measures. Thanks for the info Jen!